Bone pain, osteoporosis, gout, osteoarthritis, rheumatoid arthritis, has become the common degenerative diseases for our generation. Human has facing all this issue earlier, due to the changes of lifestyle and eating habit. Degenerative disease is a common problem in modern civilized society. In fact, this issue can be cured at the initial stage with health food or certain food supplement, however people tend to ignored it. At the end, they can only seek for physiology or surgery treatment. Please always remember, PREVENTION IS BETTER THAN CURE. A number of studies have proved that 10 grams of hydrolyzed collagen intake for a period of 4-24 weeks can increase bone density. 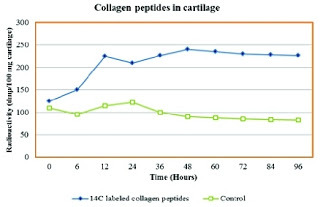 Figure 1: Radioactivity of collagen peptides in cartilage. Oesser et al (1999) investigate and prove that more than 95% of the oral administration of 14C-labeled hydrolyzed collagen will be absorbed. He also showed that within twelve hours after the intake is a critical moment because the hydrolyzed collagen will accumulate in the cartilage, and its emission level with the control group contrast more than twice (Figure 1). After oral administration of hydrolyzed collagen will be absorbed by the intestines, and then through the intestinal wall and reach the bone or cartilage tissue, in turn, stimulates the synthesis of cartilage or bone. 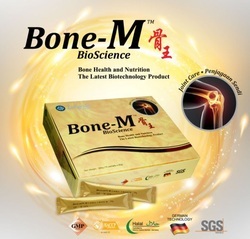 Bone-M™ contains high amount of hydrolyzed collagen and it is enriched with mangosteen skin extract. The mangosteen skin is carefully monitored and strictly controlled from farm to tertiary processing; the quality of the skin extract is always excellent and consistent. The advanced biotechnology extraction process is used to obtain the skin extract; the whole extraction process is conducted by the extraction professionals. In recent year, the mangosteen becomes widely popular around the world due to its high nutritional value. Up to now, thousand of research studies have been done on it from all over the world. Study has revealed mangosteen (Garcinia mangostana) contains high amount of xanthones, especially its skin. Base on the scientific report, xanthones are effective for anti-inflammation, anti-oxidant, anti-bacterial, anti-histamine, prevent diarrhea and cancer. There are two types of cyclooxygenase; which are COX-1 and COX-2. This two component have play an important role during the inflammation process; they mmanipulate the rate of prostaglandin synthase. γ-mangostin is the derivative from xanthones, it is being proved to effectively stop the activity of COX to reduce the inflammation rate. Other than anti-inflammation property, xanthones also possess the anti-oxidant properties. Table 1 show that mangosteen extract contain 77.8% of anti-oxidant activity. Bone-M™ also enriched with anti-inflammatory probiotic- Lactobacillus reuteri. Studies have proved this probiotic able to increase the human *IL-10, and therefore can be more efficient in treating joint pain issue. However, not all the probiotic can trigger the *IL-10. Figure 3 has shown only Lactobacillus reuteri possess this function. 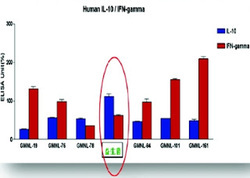 * Interleukin-10 (IL-10) is an anti-inflammatory cytokine. Bone-M™ is added with inulin as a prebiotic and calcium lactate as calcium source. The inulin canimprove the digestive system and enhance the absorption of calcium and bone mineralization process. During the bone mass regeneration process, the calcium lactate is an important nutrient to speed up the process. Bone-M™ also contains the vitamin C and mango powder which responsible for collagen and as anti-oxidant source. Furthermore, the mango powder is rich inphytochemicals and an excellent source of carotenes, vitamin C and copper. The sweetness for the Bone-M™ is from stevia extract. It is kind of natural non-caloric sweetener, which will not trigger the glycemic index. Overall, Bone-M™ is good source of collagen and suitable for diabetes people. Oesser, S and J Seifert. 2003. Stimulation of type II collagen biosynthesis and secretion in bovine chondrocytes cultured with degraded collagen. Cell Tissue Res. 311: 393-9. Eggersgluss, B. 1999.GelatineHydrolysate and its Health Aspects.Eur Food Drink Rev. Autumn. Oesser, S, M Adam, W Babel, and J Seifert. 1999. Oral Administration of 14C labeled gelatin hydrolysate leads to an accumulation of radioactivity in cartilage of mice (C57/BL). J. Nutr. 129:1891-5. Fernandez, JL and OM Perez. 1998. Effects of gelatinehydrolysates in the prevention of athletic injuries. Archivos de MedicinadelDeporte. 15:277-82. Flechsenhar, KR and D Alf. 2005. Results of a postmarketing surveillance study. Orthopaedische Praxis.41:486-94. Clark KL, W Sebastianelli, KR Flechsenhar, DF Aukermann, F. Meza, RL Millard, JR Deitch, PS Sherbondy, and A Albert. 2008. 24-week study on the use of collagen hydrolysate as a dietary supplement in athletes with activity-related joint pain. Curr Med Res Opin. 24:1485-96. Gelatin. 2002. National Organic Standards Board Technical Advisory Panel Review Compiled by Organic Materials Review Institute for the USDA National Organic Program. Daniel J. Berg, Juan Zhang, Dina M. Lauricella, and Steven A. Moore. 2001. IL-10 Is a Central Regulator of Cyclooxygenase-2 Expression and Prostaglandin Production. The Journal of Immunology, 166: 2674–2680. Xiaoling Zhang, Zebing Mao, Changlong Yu. 2004. Suppression of early experimental osteoarthritis by gene transfer of interleukin- 1 receptor antagonist and interleukin- 10. Journal of Orthopaedic Research 22: 742-750. Wolf B.W., Wheeler K.B., Ataya D.G., and Garleb K.A. 1998. Safety and tolerance of Lactobacillus reuterisupplementation to a population infected with the Human Immunodeficiency Virus. Food and chemical toxicology 36: 1085-1094. VéroniqueCoxam. 2007. Current Data with Inulin-Type Fructans and Calcium, Targeting Bone Health in Adults. J Nutr. 2007 Nov;137(11 Suppl):2527S-2533S. Adolphi B, et al. Short-term effect of bedtime consumption of fermented milk supplemented with calcium, inulin-type fructans and caseinphosphopeptides on bone metabolism in healthy, postmenopausal women. Eur J Nutr. 2009 Feb;48(1):45-53. Epub 2008 Nov 21. Ramirez-Farias C, et al. Effect of inulin on the human gut microbiota: stimulation of Bifidobacteriumadolescentis andFaecalibacteriumprausnitzii. Br J Nutr. 2009 Feb; 101(4): 541-50. Levenson, D.I. &Bockman, R.S. (1994).A review of calcium preparations.Nutr. Rev, 52(7), 221-232. M.J. Coelho, M.H. Fernandes. (2000). Human bone cell cultures in biocompatibility testing. Part II: e!ect of ascorbic acid, b-glycerophosphate and dexamethasone on osteoblastic differentiation. Biomaterials 21: 1095-1102. Joel A. Simon & Esther S. Hudes.(2001). Relation of Ascorbic Acid to Bone Mineral Density and Self-reported Fractures among US Adults.American Journal of Epidemiology. Volume 154, Issue 5 Pg. 427-433. Abdelnaser A.E. 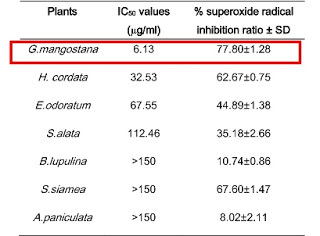 &Shinkichi T. (2010).Preliminary phytochemical investigation on Mango (MangiferaindicaL.)Leaves. World Journal of Agricultural Sciences 6(6): 735-739. Lina BA, Jonker D, Kozianowski G. 2002. Isomaltulose (Palatinose): a review of biological and toxicological studies. Food ChemToxicol. Oct;40(10):1375-81. Birkhed, D.; Takazoe, I.; Frostell, G. 1987. New experiments on palatinose (isomaltulose) as a sugar substitute. DtschZahnarztl Z 42(10, Suppl. 1):S124-S127. Glinsmann, W.H. ; Irausquin, H.; Park, Y.K. 1986. Evaluation of health aspects of sugars contained in carbohydrate sweeteners. Report of Sugar Task Force, 1986. J Nutr 116 (11, Suppl):S1, S17 & S48-S92. Akashi H.New natural Stevia sweetening agent. Hakko to Kogyo 1977; 35:1027. Brusick DJ. A critical review of the genetic toxicity of steviol and steviol glycosides. Food ChemToxicol 2008 Jul;46Suppl 7:S83‐91. Liu Z. A review of Stevia rebaudianain China.ZhonguaYaoxueZazhi. 27(5):259‐62. Heaney, R.P. (2000). Calcium, dairy products and osteoporosis.J.AmCollNutr, 19(2 Suppl), 83S-99S. Bone-M™ is a scientific validation unique formulation for bones health. 2. What is the content of Bone-M™? Bone-M™ contains Hydrolyzed Bovine Collagen, Mangosteen Skin Extract, Anti-inflammatory Probiotic, Vitamin C, Inulin, Calcium Lactate, Mango Powder, Isomaltulose and Stevia Extract. 3. What are the benefits of Bone-M™? Anti-inflammation, Regenerate the cartilage, Calcium supplement, Improve digestive system and suitable for diabetic patients. 4. Why Bone-M™ is special? Bone-M™ able to relieve the joint inflammation, repair cartilage, provide calcium and for weight management as well. 5. How long is the shelf-life of Bone-M™? Keep 24 months in original packing, unopened, under appropriate storage condition. 6. How soon will I be able to see the result? Bone-M™ has shown the positive result within 1 week for minor joint pain. For more severe condition, need at least 3 months to see the result. Consume regularly is able to slow down the aging process. Pour one sachet of Bone-M™ into 200 ml of warm water, stir well and consume. 8. What matters need to pay attention after taking Bone-M™? Please drink six to eight glasses of water a day (≈ 2.0 L). 9. If there no joint pain, can we consume Bone-M™? 10. Are there any side effects, if over the dosage? No. Bone-M™ is a food supplement and not medicine.